My Sharkbite is away on business for three days. Today is the first day and I miss him already. Not used to being apart for more than a few hours. We had some early cocktails in the dark last night during Earth Hour. I look forward to Earth Hour every year. There's something about cutting yourself off from everything that is very appealing to me. LOOOOOve your outfit!! I love the stockings and the shorts!! Had dinner with my little sister candle light style, was actually fun! ... 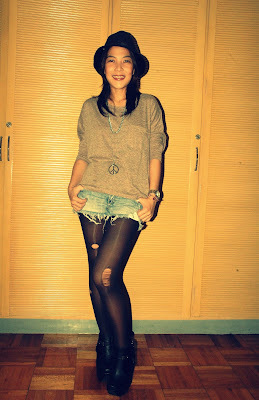 So love those boots the heel is amazing, thanks for stopping by my blog and for thw sweet words! Lowing your outfit... it has an edge to it. Wish I would have the guts to pull something like that off.... you are lovely! d-y-i-ingg!!!! Love the outfit.. Those shoes are killer!!! Your werkin them!! come check out my blog to!!.. oh those shoes.. i super love them on you! this is the best kind of outfit...comfy and casual...with some smokin shoes!! this is my first time to visit yours, i enjoy it a lot! 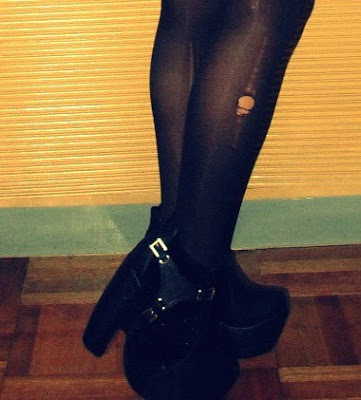 love everything, especially the shoes! amazing! i love your outfit. your shoes are amzing! where did you get them? 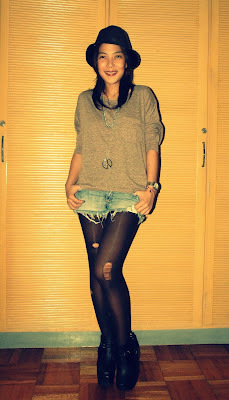 Loving the whole grunge look.....those stockings are super-cool! And I've been looking for a peace pendant like this one since a long time - but no luck till now! Woooooow I really love this outfit!! So cool! really love this outfit! so cute. I love this outfit! So cute!! Thanks for the sweet comment on my blog. :) I'm now following. New looker on your blog, come check out mine? wow those heels are insane! complements the simple outfit! Ooh, love your clumpy shoes. Nice outfit. I love this outfit (and those shoes!!). I love earth day! All of Times Square was turned off for an hour, it was amazing. Thanks so much for your comment on my blog! Cool outfit! It's something I'd totally wear myself. 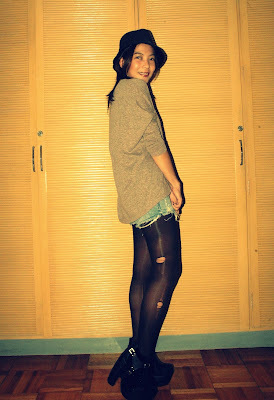 I like that you're rocking the hole-in-stockings look, you pull it off nicely!